Here's another unexpected holiday color combination. 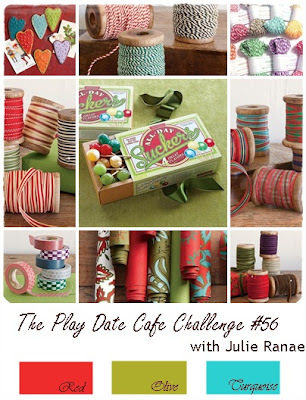 The inspiration comes from the Play Date Cafe. I love a simple card with lots of colorful layers. This card was so easy to make. I simply inked my stamp from the Season of Joy set with Real Red, Old Olive, and Tempting Turquoise Stampin' Write Markers and stamped it on some Whisper White card stock. Then I layered it on a piece of Real Red card stock. Next, I took some Tempting Turquoise and Old Olive card stocks, layered them together, then randomly wrapped some bakers twine around and tied a bow. I addhered it to my Real Red card and added my stamped layer. What do you think? Cute holiday card, the bakers tine adds a fun touch. Thanks for playing at the PDCC. Love the twiney background. Cute card. Thanks for joining us at the PDCC. I am a huge fan of twine and love what you've done with this!